This article will guide you through enabling or disabling automatic application updates on your Samsung Galaxy S4. Auto update has its advantages and disadvantages so it's all up to you if you want to enable it. 2. Find the Play Store app and tap on it. 3. Once the Play Store is up, hit the Menu key. 6. 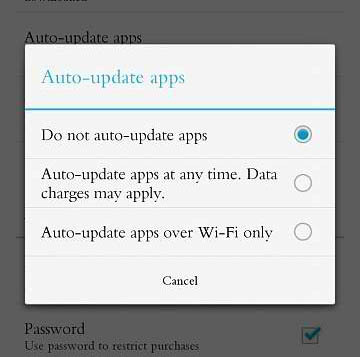 There are two options you can choose from: Auto-update apps at any time or Auto-update apps over Wi-Fi only. Choose the one that best suit your connection. 7. If you want to disable auto updates, tap Do not auto-update apps. 8. You now have enabled / disabled automatic update for your apps. If you have problems with your phone and don't know what to do, email us at sebertech@gmail.com and tell us about. We will gladly find solutions for you.